Tidewater Community College faculty and students gave a whole new meaning to the term “pie in the face” on March 14. 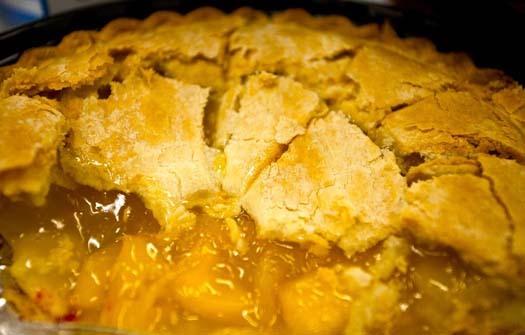 March 14 or 3/14 is National Pi Day, an unofficial holiday commemorating the mathematical constant Pi (π), as designated so by the House of Representatives in 2009. Pi is a mathematical constant that is the ratio of any Euclidean circle’s circumference to its diameter. Written as π, it is approximately equal to 3.14. Its infinite nature has enthralled scholars from all centuries, some of whom have carried Pi out as far as 5 trillion decimals. Norfolk Campus Provost Marvin Bright, Student Government President Coby Dillard and a mathematics professor selected via student vote received whipped cream pies in the face in front of the Norfolk Student Center, commemorating the beloved math concept. Professor Sarah DiCalogero won the student vote, but a sick child forced her to miss the festivities. Professor Joe Joyner, the runner-up, graciously agreed to be her sub. Bright, wearing a garbage bag to protect his suit, was the first to be “pied,” courtesy of Dillard, who smacked the provost in the face, swirling extra cream on top of his head. 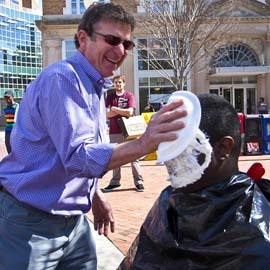 Bright passed off the “pieing” honors to Professor Richard Gill, who shrugged, “Nothing personal. Hope it tastes good,” before he gave Dillard a face full of pie. Joyner, wearing his “Math is fun!” shirt, was next, and Professor Judy Gill did the job. “What can I say? This is the students’ choice,” she said to more cheers by the students. What’s so remarkable about Pi? That’s a good question to ask Professor Julia Arnold, who helped organize the event along with assistance from the math department; Student Government; Mu Alpha Theta, the math honor society; and Student Activities. Pi dates back to Archimedes of Syracuse, who provided an approximation of the number during the 3rd century BC. The world record for memorizing and reciting Pi was supposedly set in 2005 by a Chinese graduate student who spent a year learning 100,000 digits and was able to recite Pi to the 67,890th decimal point before he made an error. The same verse, found in II Chronicles 4:2, occurs in a list of specifications for the great temple of Solomon, built around 950 BC, and it calculates π = 3, a widely disputed concept. Because really, Pi goes on forever.